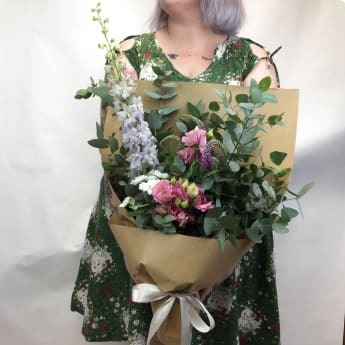 Add Daily Bouquet 12 Feb, 2019 to your order? A delicate but powerful bunch of flora consisting of Delphinium, Lisianthus, Veronica, Chrysanthemums, Spray roses huddled together in fresh scented gum. Grab this ultimate pastel arrangement for anyone you’d like to share some love! Our daily bouquet is very limited, always insta-worthy! and only available for Sydney delivery 12 Feb, 2019 if ordered by 2pm or until sold out.